With a programmable slow cooker, you can truly "set it and forget it." These models have timers that mean you don't have to be present when your food is done cooking -- the slow cooker will automatically switch to "warm" until you're ready to eat. Most have digital displays instead of a simple knob, and some may have additional temperature or cooking functions. 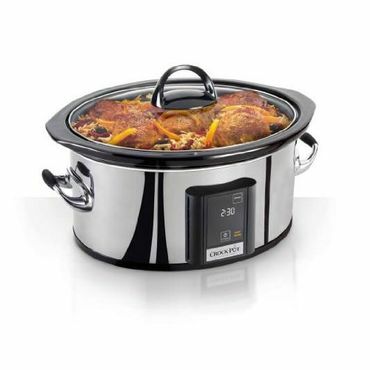 While there are a handful of smaller programmable slow cookers, most have capacities of at least 5 to 6 quarts and up. If you're looking for an all-around strong performer in this category, the Crock-Pot Programmable Touchscreen Slow Cooker (Est. $70) is a top pick for much less than some of the other contenders in this category. It has a 6½-quart capacity -- enough for a substantial meal, including a 7-pound roast. Of course, the bigger capacity means this unit will take up more space on your counter. The polished stainless steel and sleek touchscreen are easy on the eyes for dŽcor-conscious cooks. Like the portable Crock-Pot Cook & Cary, the Crock-Pot Programmable Touchscreen Slow Cooker has a timer that you can set for 30 minutes up to 20 hours. Once the cooking time has completed, it shifts automatically to warming mode and begins counting up, making it easy to tell precisely how long food has been warming. The control panel is described by experts as "easily understood and attractive," and the removable stoneware insert is safe to put in the dishwasher, refrigerator, microwave or oven. John Kirschner of Techlicious.com made the Crock-Pot his top pick in a test of six competing models, citing its consistent performance and low price. He does note that the exterior and handles can get "burning hot," however. While hundreds of owners give the Crock-Pot good reviews, praising its performance and the variety of features for the money, a number say the lid doesn't fit snugly enough. Others also mention the hot exterior. If you aren't sold on the Crock-Pot Programmable Touchscreen Slow Cooker, one worthy competitor is the KitchenAid 6-Quart Slow Cooker (Est. $100). This unit has a slightly smaller 6-quart capacity and a slightly larger price tag than the Crock-Pot, but earns the top recommendation in one expert roundup, beating seven other models in head-to-head testing. It has a sleek stainless-steel exterior, but it has a slightly larger footprint than the Crock-Pot if space is a concern. The KitchenAid comes in two nearly-identical variations: one with a solid glass lid and one with a split, easy-serve lid that's hinged on each side of the handle for one-handed serving. If you thought the Crock-Pot's 20-hour timer was generous, the KitchenAid's 24-hour timer may really wow you. Again, this is probably overkill for most cooks, but it could come in handy in special circumstances, such as complicated holiday meals. Testers say controls are easy to use. Something else that sets this model apart is the presence of a "medium" setting -- most slow cookers only have "low," "high," and "keep warm." The removable stoneware insert is dishwasher safe, but KitchenAid does not recommend using it on the stove or in the microwave or oven. The KitchenAid performed admirably in one expert test, turning out "juicy and tender chicken, turkey, pork, and chili, and caramelized onions were evenly cooked." In FoodandWine.com's tests, this model "ran the lowest and slowest by far," reaching 180 degrees after six hours on low and falling quickly to 160 degrees within an hour of switching over to the warm setting. After four hours, the temperature dropped to 147 degrees. On the flipside, a possibly faulty unit failed to bring food to an acceptable temperature in Techlicious.com's tests. The unit gets strong ratings in owner reviews for reliable performance and versatile controls, but some complain that the insert cracked under normal use. We also read a few complaints from users who experienced issues getting their units to an acceptable temperature, similar to the issues reported by Techlicious.com. The Hamilton Beach 6-quart Programmable Stovetop Slow Cooker (Est. $70) performs well in FoodandWine.com's tests, reaching 183 degrees in six hours on the low setting and falling to 169 degrees after an hour on the warm setting, eventually dropping to 150 degrees after four hours on warm. It cooks foods evenly, DiGregorio says, and produced a "delicate, uniformly browned strata." TastingTable.com's Jessica Harlan says the Hamilton Beach is a solid combination of quality and value, holding its own against pricier models. It doesn't have a stoneware insert like many slow cookers; instead, the insert is made from non-stick, coated aluminum that's also safe for stovetop use, a feature that users appreciate. The aluminum insert is also lighter than a typical stoneware insert, making it easier to wash by hand, and it's ideal for sautéing vegetables, browning meat and similar prep work without dirtying multiple pots and pans. The Hamilton Beach has easy-to-use controls, including a large dial to adjust the heat settings and plus/minus buttons for adjusting the timer in 30-minute increments (up to 10 hours). While the handle on the lid stays cool, you'll need oven mitts to handle the insert, as the handles get hot to the touch. The insert is not dishwasher-safe, and you'll need to use wooden or nylon utensils, as metal instruments can damage the non-stick surface. A few users wish the timer could be set for more than 10 hours, but most agree that it's versatile, ample in size and efficient.